New from Roboworm, their Ned Worm. Impressions: Roboworm's Straight Tail and Fat Worm baits have been a staple in the boxes of each TackleTour Editor since I can remember but aside from the company's EZ Shad Swimbait, they've been relatively quiet with new bait introductions, so when we caught wind of their new Ned Worm baits, we were all over them wanting to see how effective this new little bait would be. Before diving into Roboworm's design let's wind it back and pay homage to Ned Kehde, the angler and outdoor writer that was primarily responsible for putting this hybrid technique on the map. Called by many names this "Midwest finesse" style of fishing usually employs half a plastic stick bait and a small mushroom, or other shaped jighead, inserted flush into the flat side of the stickbait. Today manufacturers like Yum and Roboworm are creating worms specifically for this technique. 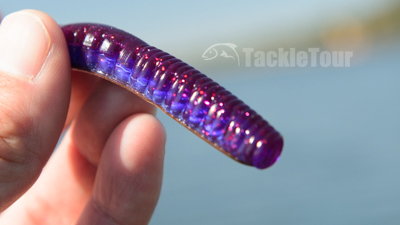 The Ned Worm is available in a 3 and 4.5 inch size. 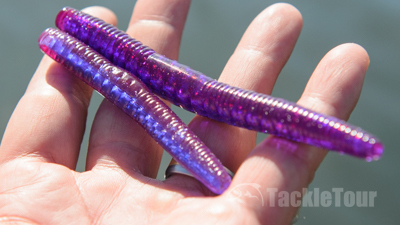 Roboworm's Ned Worm is available in two sizes, three and four and a half inches (3" & 4 1/2"). 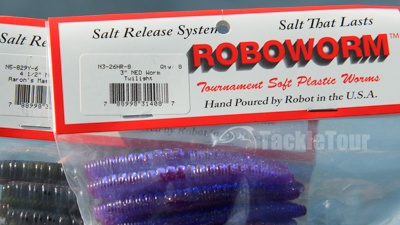 They are very bit the profile of a traditional soft plastic stick bait only shrunk down in proportion and made from that fish-catching, soft, salt injected, Roboworm plastic. They're available in twenty different colors including Aaron's Magic, Morning Dawn, Prism Shad, and Margarita Mutilator. The 4.5" version has a very traditional stick bait shape. Real World Tests: Normally I'll fish soft plastic baits a number of different ways quite often the least of which is the application for which they are intended. But with Roboworm's Ned Worm, given the bait is named after the technique for which it is intended, I couldn't help but fish this bait on a weighted jighead. 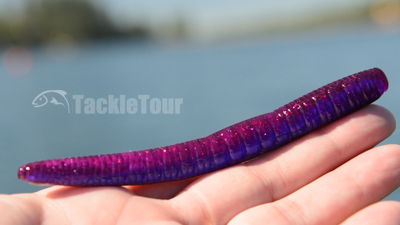 A look at the fat end of Roboworm's 4.5" Ned Worm.